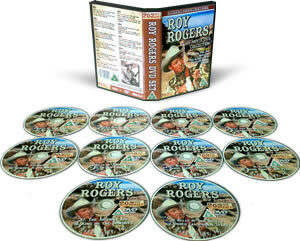 Roy Rogers DVD Box Set. 20 classic movies on 10 DVD's. Roy Rogers is one of the most famous cowboy actors and stars along side his famous side kicks Trigger and German shepherd Bullet in these films. Films also include some of his great music and singing. All the best classics from Roy Rogers including : Carson City Kid, Under California Stars, Colorado, The Arizona Kid, Young Bill Hiclok, Utah, In Old Caliente, Billy the Kid Returns, Rough Riders' Round-up, Days of Jessie James, Sheriff of Tombstone, Robin Hood of the Pecos, Lights of old Santa fe, Hands Across the Border, My Pal Trigger, Heldorado, Cowboy and the Senorita, Bells of Rosarita, Bells of San Angelo, King of the Cowboys.There is literally hours of classic western film entertainment in this boxset. If you are a classic western fan check out our other western box sets, some of which contain this set as part of a super deal pack.With our satisfaction guarantee you are certain to be 100% happy with your purchase, or you can return for a refund within 48 hours. At this price you just can't go wrong, grab one whilst these are still in stock. 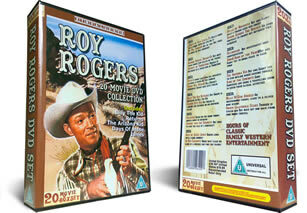 Roy Rogers King of the Cowboys dvd.